I have been M.I.A. lately due to a little sickie and some spring cleaning! I mentioned last week that I was a teensy bit annoyed that Katie wasn't eating (except for the middle of the night goldfish binges) and that she wasn't sleeping great. Well, it turned out she had another ear infection! It's her 3rd in 5 weeks! She has never had this issue before. The doctor says it's caused by allergies. I can't control all the fungus going on outside, but I am trying to do what I can inside. Everything is getting wiped down, disinfected, washed, sanitized, and cleaned out! It's pretty darn time consuming! 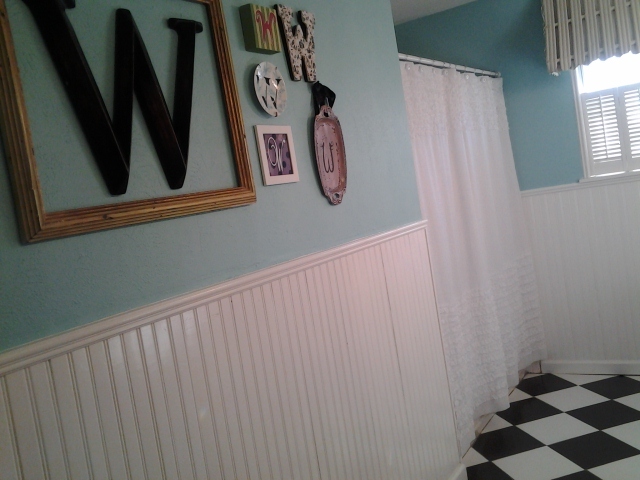 Today was the bathroom's turn. 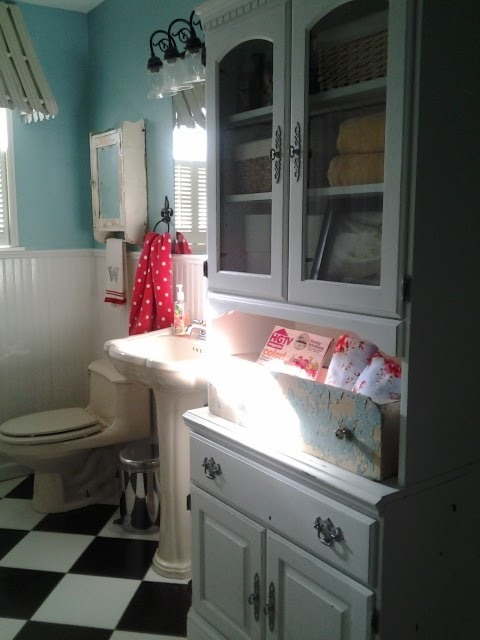 Look how God had the sun beaming through the window after it was all clean! I think He approves and maybe He's saying, "FINALLY!" 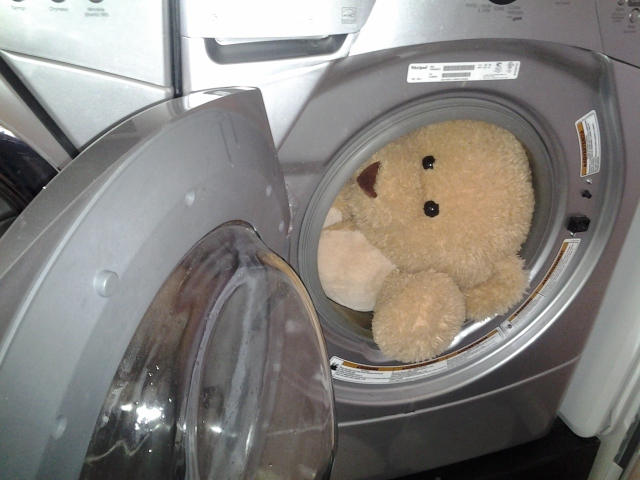 I even took down the shower curtain and liner and washed them in the machine! This is serious business people! I also got most of Katie's room cleaned today too. I even washed her stuffed animals! They turned out great! I totally cleaned out her closet and drawers too. I realized today, how desperately the girl needs some clothes! She has gotten pretty tall and her shirts and pants just don't fit anymore. I am hoping all this hard work will lead to a healthier kid! It just all needs to be done anyway. And secretly in my head I was pretending like I needed to get my house ready to put on the market! I have the moving bug! We don't have plans to move yet, but the bug has bitten me! Marcus and I both would love to build a little simple farmhouse on some land. That's our dream. Not too little, because we like to entertain and have people over...and I've got a lot of stuff. I have been looking at Pinterest for some ideas, while I dream! While I was looking I found this "simple" farmhouse. I think I could be happy living there! Hopefully I will find a pot O gold when I am spring cleaning! Thanks Kate! I'm glad I have a homey bathroom! And yes, toddlers make it nearly impossible to have a clean house! i totally get how you feel about moving...saw this the other day...texascasualcottages.com....check it out - super cute farm house cottage plans for inspiration. At least they got the big porches right. Love your blog and have missed your posts these last few days. If you are still in the mood to clean, I have a house that is in desperate need of it and I HATE doing it. Or you could come supervise!! LOVE your bathroom! Would so love for mine to look like it! I too think your bathroom is charming and I applaud your cleaning efforts! I need to clean more to keep the dust down too. My son has had a double ear infection this week so my house has been neglected. I'm hoping to change that today! I am so sorry Katie is dealing with awful ear infections. Heloisa had three last year. 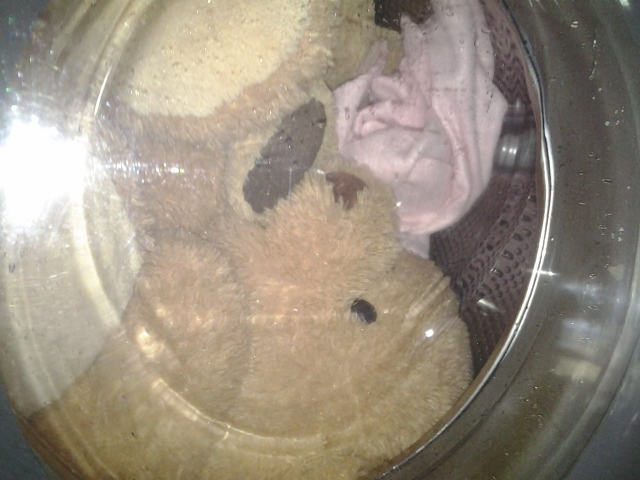 To help keep dust from the stuffed animals, my Mom thought me to freeze them for 24 /48 hours. It helped a little. And her doctor told me to change sheets and towels two to three times a week too.